The distance to the sun and the celestial bodies has been in some contention over the years. 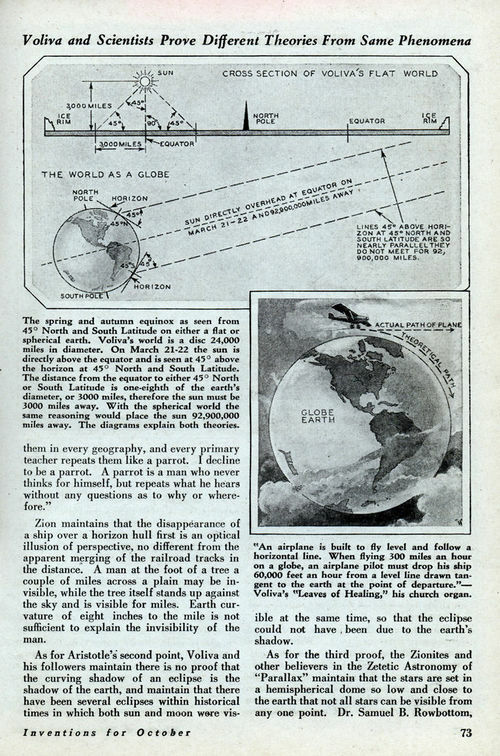 In Chapter 5 of Earth Not a Globe Samuel Birley Rowbotham computes the sun to be less than 700 miles above surface of the earth, and the stars contained within 1000 miles. Later researchers have estimated the sun to be at about 3000 miles above the surface of the earth, with the stars at about 100 miles above that. The purpose of this page is to showcase the historic methods that have been used to determine the height of the sun and celestial bodies. Q. Why are the celestial bodies and the sun so close to the earth's surface in the Flat Earth Model? A. The celestial bodies must be close because if the shape of the earth changes, the distance to the celestial bodies must change as well. Astronomers use two different observations on far off points on earth to triangulate the distance of celestial bodies. When the shape of the earth changes, the triangulation changes, and our perception of the universe must therefore change as well. Here's a link which explains the idea: http://www.millersville.edu/physics/experiments/058/index.php. The first part goes over the Round Earth explanation for how the sun can be computed millions of miles distant. At the bottom there is a Flat Earth explanation for how the sun can be computed as being very close to the earth's surface. Scroll all the way to the bottom to the "alternative model" section. You will find that we can use Eratosthenes' data, in conjunction with the assumption of a Flat Earth, to confirm that in FET the sun is very near to the earth's surface. Hence, if we assume that the earth is flat, triangles and trigonometry can demonstrate that the celestial bodies are fairly close to the earth. sun would have been quite plausible to the ancients. distances R1 and R2 are approximately 3000 and 3900 miles, respectively. There is no other way to get a distance for the sun. Just looking at it from a single point on earth will not tell you its distance, you must look at it from several points and account for the curvature or non-curvature of the distance between those points. we make the trip. We conclude that the flat earth/near sun model does not work. miles. 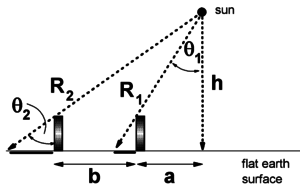 Ergo, the sun would be an equal distance above the equator.